Avengers: Infinity War is going to be big. That was never in doubt. Thanos’ galaxy-wide hunt for the Infinity Stones was only ever going to end one way. But we never thought it’d be as massive as it looks like it’s turning out to be. 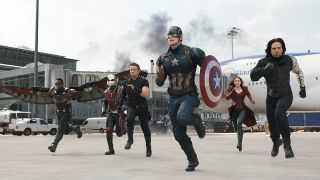 The previous granddaddy of gigantic action scenes was Captain America: Civil War’s none-too-insignifcant airport scene. By the sounds the Russo Brothers are making, we can expect that to be topped by some distance. Speaking to Screen Rant, the Infinity War directors were asked about previous comments, calling Civil War (which they directed) and its big showdown between Team Cap and Team Iron Man being likened to a big splash page in a comic (that’s a double page spread, for those not down with the kids) and how Infinity War compares. Their answer is… well, see for yourself. “We have like an equivalent that’s like, you know, if you had a comic book and you open it up to your double panel and then you fold it out. And then you folded it out again and again,” Joe Russo explains. “And you have another comic book laid out next to it,” says younger brother Anthony, painting a picture of one helluva fight. A reminder: it's going to be a scene bigger than one involving Iron Man, Cap, Spidey, Ant-Man, Falcon, Scarlet Witch, Black Panther, the Winter Soldier, Falcon, Black Widow and Hawkeye duking it out. Phew. By my count, we’re looking at – going by the folding theory – a scene that’s at least eight times as big as Civil War’s effort. Sure, it might just be hyperbole – or we could be looking at one of the biggest fight scenes in movie history. I’m hoping for the latter. We’re all hoping for the latter. Of course, we’ve come a long way to reach this point. Join us on our big MCU recap every Sunday to make sure you’re all caught up before Infinity War.